Original Recipes was founded in 2012 by father and son team Alistair and Will Sutherland, drawing from secret formulas first produced by Alistair’s grandmother in the 1920’s. 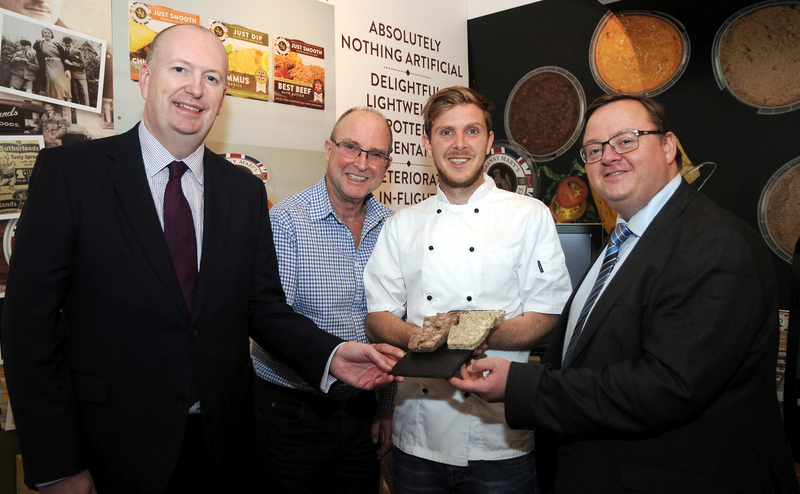 A Derbyshire food specialist which produces a range of mouth-watering pâtés and terrines is aiming to treble its capacity after securing a £25,000 investment from NPIF – BEF & FFE Microfinance, part of the Northern Powerhouse Investment Fund (NPIF), in order to fulfil its growing order book. Father and son team Alistair and Will Sutherland founded Original Recipes in 2012, drawing upon secret formulas first produced by Alistair’s grandmother in the 1920’s, transforming the Sutherland name into a household brand with its range of spreads and pâtés enjoyed by millions of people each week. Over the past five years, Alistair and Will decided to call upon their long family association with the foodservice industry, pioneering a new range of tasty terrines aimed specifically at the professional catering sector. After securing a number of large orders, they called upon Finance For Enterprise, to help purchase additional new equipment after seeing an increase in demand for their new products from the professional catering market. Since securing a NPIF loan, the Chesterfield-based business has invested in new kitchen equipment, enabling production capacity to increase from just over 1,000 terrines per week to more than 3,300. The funding has also been used to safeguard two jobs within the business, and two new jobs are due to be added to the Original Recipe’s workforce within the next six months. At the same time, Alistair and Will have also invested in developing a number of tasty new recipes which have been added to their range including Pulled Pork with Honey and Spices, Confit of Duck and Fig as well as a vegetarian range featuring Mushroom, Port and Stilton and Spicy Pimento Cheese – all of which are made by hand using traditional production methods. The funds provided by NPIF – BEF & FFE Microfinance has enabled Original Recipes to fulfil orders with a growing number of sports stadia and event management businesses including the Royal Armouries, Hull Kingston Rovers and Derby County FC, as well as securing regular orders from pubs and restaurants across the UK. “Since launching the business in 2012, we explored a number of different routes to market, and realised that whilst pâtés and terrines are always a popular choice whenever they appear on the menu, they can be complicated and costly for professional chefs to produce. Terrines take specialist knowledge and lots of time to perfect, which can often be incompatible with the demands of catering for large events. “Our range was developed to help chefs offer greater variety on their menus, whilst providing customers with a premium product. After spending many months perfecting the recipes, the orders started to flow in and we knew that our current kitchen facilities were not capable of meeting demand. We contacted our bank, however with an unproven trading history and changes in the way business loans are provided, it was practically impossible to secure the finance in the timescales we needed. “Original Recipes is a relatively unique business which has been built upon specialist knowledge, handed down from one generation of the Sutherland family to the next and after discovering a niche in the marketplace, they recognised that it was essential to invest in the equipment needed to expand production, whilst also providing working capital to support future growth. “As a not-for-profit organisation, Finance For Enterprise works closely with business owners to help them choose the right form of funding to meet their needs. We worked with Original Recipes to help them access the Northern Powerhouse Investment Fund which was created with businesses like Original Recipes in mind, who require short-term investment to unlock the true potential of their business”.